It can’t happen to you — until it does. I recently had my life turned upside down during a move from Ohio to Tennessee. I packed up everything I owned into a trailer, only to wake up a day later to a phone call notifying me that the trailer had caught fire during the trip. I lost almost everything. If you haven’t lost your belongings and/or home to a fire and are just reading to stay prepared, kudos to you. Count your blessings. There are a few steps you can take now for the “just in case” security that will ensure you’re in good financial standing should disaster strike. If you have recently lost everything to a fire, don’t stress. Once you’ve started to recover emotionally, you can begin considering how you’re going to recover financially from this disaster. When it comes to maintaining your family’s financial security, there is no such thing as being overprepared. Take the following steps to ensure you’ll be able to bounce back should you lose your home and/or your belongings to a fire. I was fortunate enough to be required to carry renters insurance, which will cover some of my losses. Others in this situation aren’t so lucky. I was not, however, as prepared as I should have been. I carried the minimum coverage my landlord required and didn’t think twice about how much I should really be covered for. My advice? Don’t settle for minimum coverage. Clothes — Think about how much money you’ve invested in your work attire, your shoes, your pajamas, your gym clothes, and throw in those towels, pillows and blankets while you’re at it. Toiletries — Make a list of all your expensive lotions and shampoos, your electric razor and your medicines, prescription contacts and retainers. You’ll really get a feel for how much money you’ve got inside your bathroom drawers. Decorative items — Don’t forget about any expensive (or inexpensive — money’s money, right?) art pieces, decorative items, wall hangings, clocks and lamps. Cooking utensils — Add up the price of your plates and bowls, pots and pans, toaster and coffee maker, and think about how much money in groceries you typically have in your cabinets and fridge. Once you’ve calculated how much your possessions are worth (and, if you own your home, how much coverage you’ll need for your house as well), pick a plan that will cover those costs. My other advice? Read the policy details before signing. You’ll want to know what is actually covered under your policy. The big mistake I made was not knowing the difference between replacement cost value (RCV) and actual cash value (ACV). RCV means the insurance company will give you what it actually costs to replace your refrigerator; ACV means it will only shell out what your 4-year-old fridge is worth now. Guess which one I had. In today’s world, it can be difficult to put aside money for anything. With IRAs, 529 plans and regular savings, who has the change to spare for an emergency fund? Don’t neglect building your emergency fund. You never know when you’ll need it. If you’re single and rent your home, put away three months of take-home pay. If you’re married, own your home and have a kid or two, put away six months of take-home pay. Your emergency fund doesn’t have to happen overnight, but it is definitely something you should be saving toward. It’s not as glamorous as saving for a trip to Ireland or a new car, but it could make or break you in the event of a fire or another natural disaster. 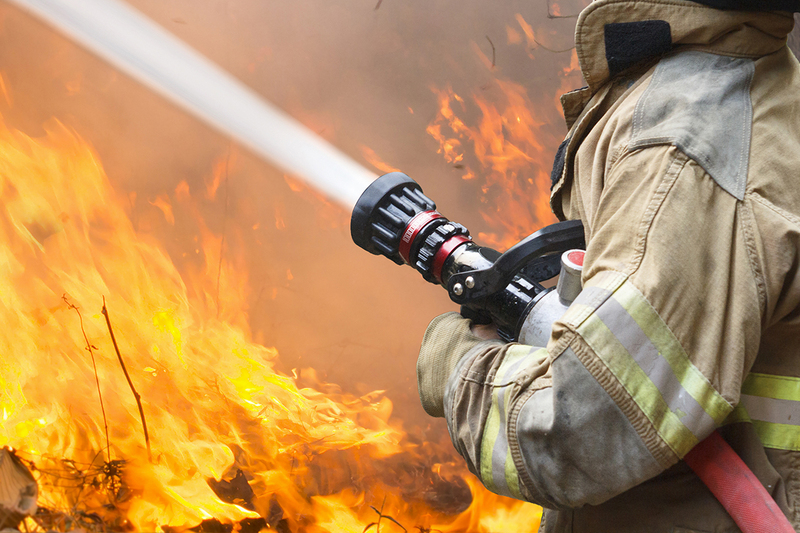 Unfortunately, a fire department responds to a house fire every 23 seconds, according to the National Fire Protection Association. If you’re the recent victim of a fire, take the time you need to recover emotionally, but stay disciplined so that you can quickly begin to rebuild financially. Put together a list of all the items you lost, including their value, where you bought them and their age. Keep all items until an insurance adjustor has assessed the damage and taken photographs. Take your own pictures and videos for your records, and provide those to your insurance company, even if they aren’t requested. File away all receipts related to the fire, including temporary lodging, the cost of bulk trash removal and the cost of repairs, whether it’s trips to the laundromat or total home reconstruction. If you’ve been saving for an emergency, now is the time to make a withdrawal. If all goes well, you’ll be able to replenish some of those savings with insurance money down the road. Just be prepared to wait a few months, because the reimbursement process can be lengthy. I’m not the type who is comfortable asking for or taking money from friends and family, but a real crisis like a fire can change your perspective. I am immensely grateful to the friends, family, co-workers, and strangers who donated money through GoFundMe or just by sending checks and gift cards, who held bake sales and fundraisers, and who donated their furniture or even just their time. Whatever someone is offering, don’t be ashamed to say yes if you need it. Just don’t forget to say thank you — and be ready to pay it forward to someone else in need once you’re back on your feet. A fire or another unexpected disaster can be devastating, but it doesn’t have to ruin you financially. Start preparing for the worst now — and if the worst has already happened, step into action mode and begin rebuilding your finances today. Timothy Moore is a full-time editor and doggy daddy, but he likes to devote time when he can to writing — whether it’s for his own novel or online. He is new to the Nashville area and is excited to explore the city with his partner. Go Preds!